Day 2 of the “self-care reboot” (as I’ve dubbed it) started with the alarm waking me at 4:30am. I don’t normally bounce out of bed on my “early morning workout” days, but I don’t usually crawl out either; however today I was definitely moving slower than normal making my way to the kitchen for my hot lemon water…. I’ve been a little stressed lately with family health issues and I know that that stress is manifesting itself physically. 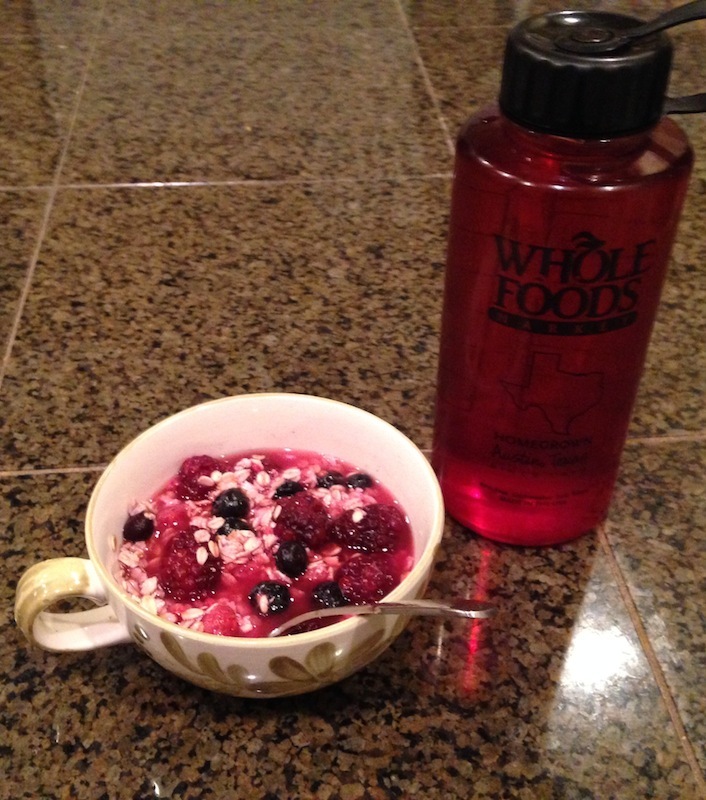 After a cup of hot lemon water and a bowl-full of gluten-free oats topped with berries, I was feeling better — still not great, but ready to lead my 5:30am workout. When I got home at 6:35am, my husband greeted me with the news that 3 of my 5 children, Sally, Lucy, and Ellie, woke up sick, with fever, headache, sore throat, stuffy nose, all the typical “cold & allergy” stuff. 😦 So after sending the two well kids off to school, despite a long to-do list, I curled up with my triplets, just like I did when they were babies (they’re now 11), and we all went back to sleep. After my nap, with my “babies” still sleeping, I decided to make it a morning of home self-care with an Epsom salt bath…. mind you, I do not like baths. I’m a “quick shower” kind of girl, but I am also a rule follower, so since it is on the list of elements for the re-boot, and since I was home anyway, I decided to “get it over with;” the laundry, errands, and other to-dos could wait. Also, I decided to “multi-task” and add another treatment I usually dread to my bath: ice-water soaks for my feet and ankles to treat plantar fasciitis. Painful, but so therapeutic and healing — so much needed! I must admit, the first 10 minutes in the Epsom salt bath felt good (especially compared to the ice soaking! ), but after about 15 minutes I started pouring sweat and feeling really anxious (not at all relaxed), and I only made it 20. I may have to “train” to make it the full 40 minutes like I train for a marathon(! ), with slow progression, I’ll shoot for 25 minutes next time. 🙂 Writing some of this journal and sipping on the iGnite cranberry water as I soaked definitely helped. Fast forward again, to the end-of-school-day chaos and a late afternoon snack of figs, raspberries, and blackberries. Taking time to eat in the late afternoon or early evening, for me, takes some effort; I often go from lunch through the “after school blur” to dinner without eating or even drinking anything; but being more mindful of staying hydrated and nourished throughout the day, and adhering to the re-boot rule of eating 5 meals/snacks daily (again I’m a rule follower! ), I’ve been reminded the last two days of what a huge difference a nutritious snack makes in maintaining a high level of energy and a positive attitude/mood. Today it helped me get through the “homework hour” (my girls love school and their amazing teachers and asked that work be sent home! ), and then to volleyball (for Lucy who had a miraculous recovery and didn’t want to miss practice ;)), and also fueled me through the youth running group that I coach. Exhale…. and finally, DINNER! My husband’s delicious (and beautiful!) beet borsch (beets, carrots, cabbage, leeks, tomatoes, and potatoes) served with quinoa and avocado. I LOVE this meal; it is delicious and it certainly doesn’t hurt that my husband makes it instead of me! And the kids gobble it up too. Warms my belly and my heart. And now, bedtime…. which, with 5 school-age kids, means the day isn’t over yet! How is YOUR Day 2 going? Are you feeling any bit like Alli? Leave an anonymous comment below to share your experiences and ask questions — the iGnite team will get back to you with tips and more great info to help you through the process! This entry was posted in Healthy Kitchen, Nutrition, Parenting, Self-Improvement and tagged alli phillips, austin, body re-boot, cleanse, detox, health, ignite, ignite your life, nutrition, women's wellness on September 24, 2014 by iGnite Your Life. Well today is Day 3 and I woke up last night at 11:45pm and thought I had the flu. Today has been really HARD!! No energy, laying on couch right now as I type this because I am still having flu like symptoms. . “This journey will require you to make tough sacrifices, but I’ve come to look at this process as embracing healthy choices rather than denying myself.” This comes from the book Made To Crave by Lysa Terkeurst. I will push on to Day 4 because I know what I will learn with this experiment will out weigh the negative things I am feeling now! I am remembering this quote to keep me going! We can do it!! !